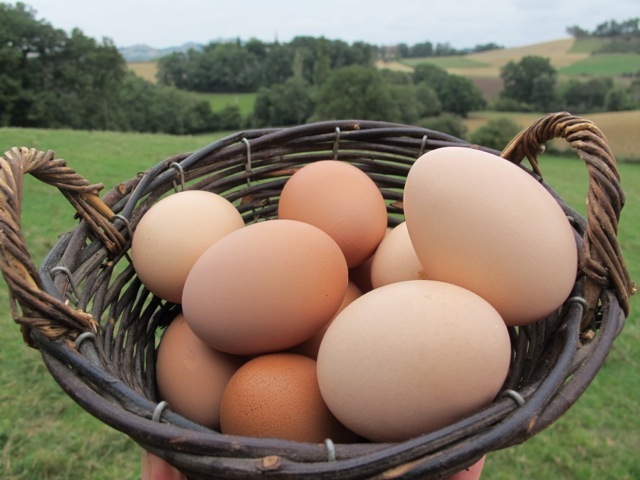 Our neighbour Flo left us eggs and onions in exchange for feeding her cats and hens while she and her husband spend a few well-earned days rest in Corsica. So, here’s another omelette/scrambled egg thing. 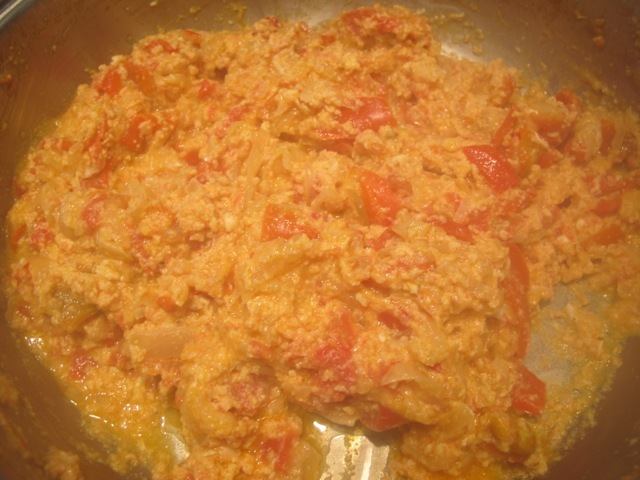 (see courgette eggs). This time a classic peasant dish from the Basque Country in the southwest corner of France. 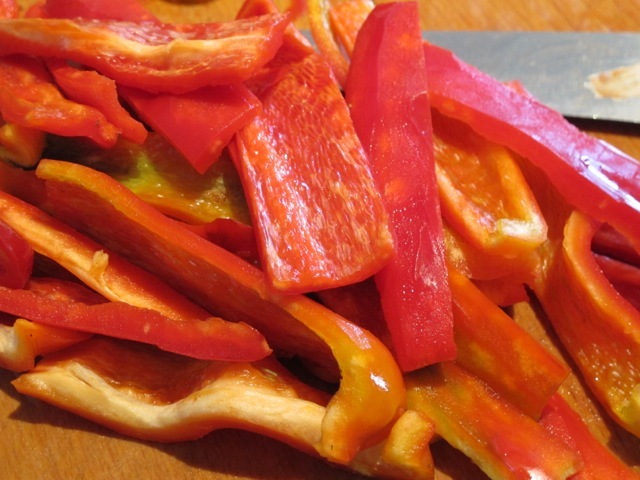 Sweet local peppers are in season now–late like everything else–piled high on the market stalls. The ones I used were sun-ripened in Pezenas (southeast of us) and sweet–thinner- skinned than their year-round supermarket cousins. 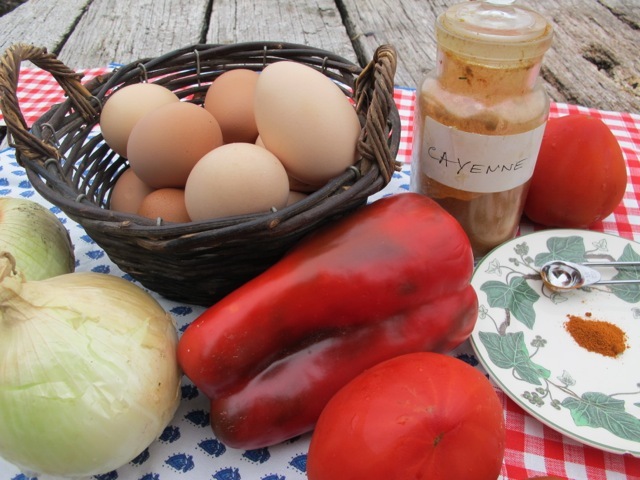 Eggs, peppers and tomatoes (also from Pezenas) make up PIPERADE–plus a pinch of cayenne for PEP. 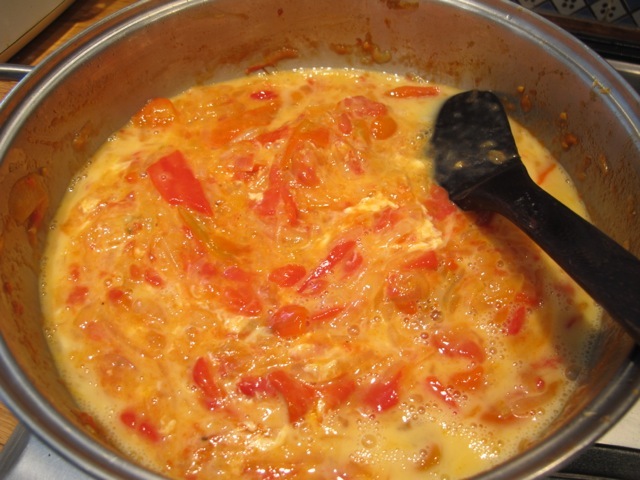 Some versions make a purée of this mix before adding the eggs–which is an option. 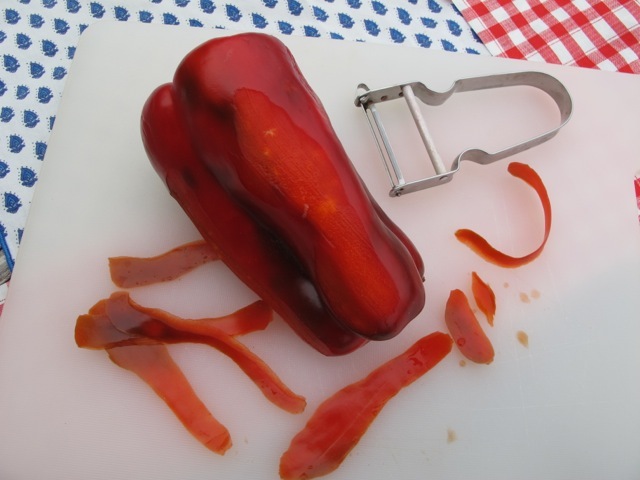 I favour leaving the vegetables roughly cut to add texture. Heat the oil in a medium pan. 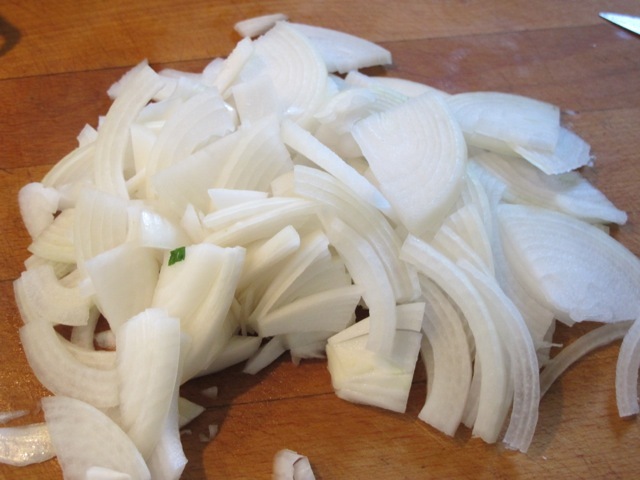 Add the onions and cook on a low heat for 20 minutes–they should become soft and pale. 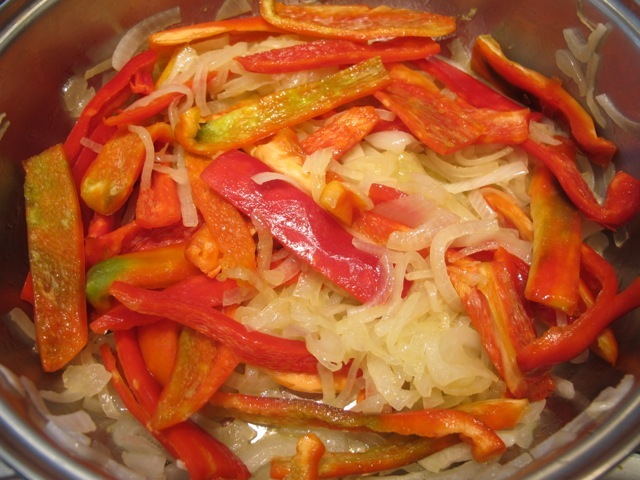 Add the pepper strips and turn them over in the onion. Cover and cook for about ten minutes. 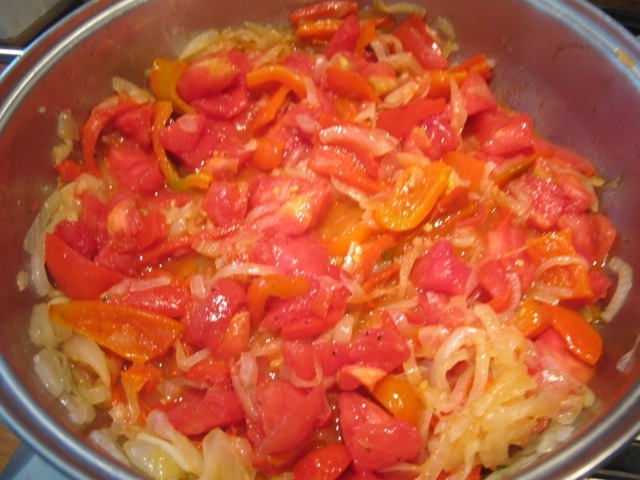 Add the tomatoes, cayenne, salt and pepper and mix in. Cook for 10 minutes covered on the same low temperature; then a further ten uncovered to lift some of the excess liquid. …until the eggs are done to your taste. Served with a green salad it makes a handy light lunch. I just am just about to make this now having some little eggs from my neighbours’ beautiful bantam hens! Good timing! Bob has been in hospital for nearly three months with a series of problems but he is now home and started on recovery! He landed in a ward dealing with type 2 diabetes / general medical (he is not diabetic). I was utterly shocked at what I experienced there. The lucky patients only lost a toe but they were few and far between. Mostly they were losing feet and lower limbs. And so many people in just a medium sized town. I had not realised that such suffering had reached epidemic proportions. All were considerably and very overweight. Bob was the only slim person in the ward most of the time. I have never before seen legs that were black, not just dark but black. I asked several people if they had been given any advice about diet and they all said ‘yes’ but well they hadn’t really followed it. I could not believe it so I told everyone about your excellent book and I just hope that some will follow it and that the sales in the west of Scotland go up! In the next bed, I heard the wife of a patient say “Oh I see they are going to change your insulin tomorrow and I nearly forgot I just brought you a Mars bar”………. Very sad to read this, Eva. The Mars bar bit especially. Relatives and friends often don’t understand the condition and its possible consequences. A good and informed support system is as important as a good doctor I feel. Yes it’s up to each of us to take as much responsibility for our own health and those of our friends / family as we possibly can and to keep challenging the norms and take advantage of the information now so widely available.